Ben Wunderly, museum curator at the North Carolina Maritime Museum in Beaufort and co-collaborator with John Hairr on the Surfing NC Project, spoke at the October 15, 2018 meeting of the Federal Point Historical Preservation Society. Ben spoke on the History of Surfing in North Carolina. After the turn of the century, reports of surfing in North Carolina became more widespread. A 1907 postcard from Wrightsville Beach appeared to show surfers in the water, though an ancient precursor to Photoshop may have been used to doctor the photo. The earliest well-documented surfing activity in North Carolina was Virginia Dare Day in 1928, which featured surfing demonstrations by NC surfing pioneer Willie Kaiama. By the 1950’s and 1960’s, surfing in North Carolina had spread – even inland to the original Bert’s Surf Shop in Kinston. Given the lack of beaches in Kinston, Bert had to sell clothes and shoes along with surfboards before opening a series of surf shops along the coast. 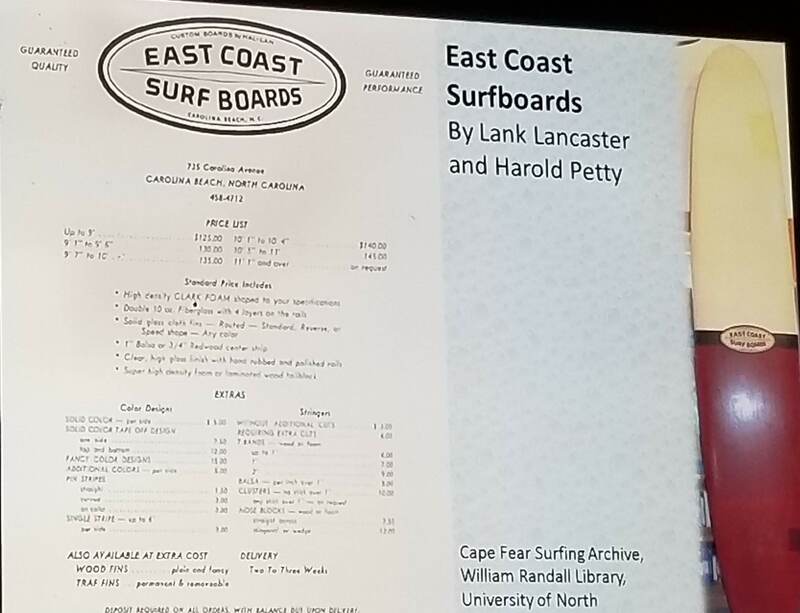 In 1964, Harold Petty and Lank Lancaster founded East Coast Surfboards in Carolina Beach, shaping their own brand of surfboards. 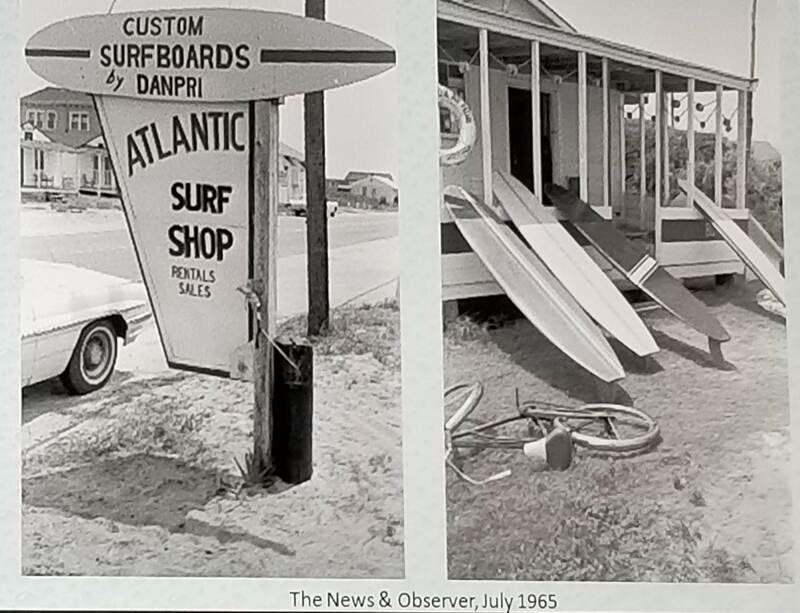 In 1965, the Atlantic Surf Shop opened in Kure Beach, despite the town leaders banning surfing that summer due to complaints from fishermen who blamed the surfers for their bad luck. The Spring Surf Festival was held at Lumina in Wrightsville Beach in 1966. By 1974, the North Carolina coast was recognized for having the best surfing on the East Coast, and the United States Surfing Championship was held in Buxton, the first time since the competition started that it was held on the East Coast. In 1997, the East Coast Wahine Championship of Surfing was established at Wrightsville Beach. Due to time constraints, Ben was not able to talk in much detail about more recent history in this presentation. 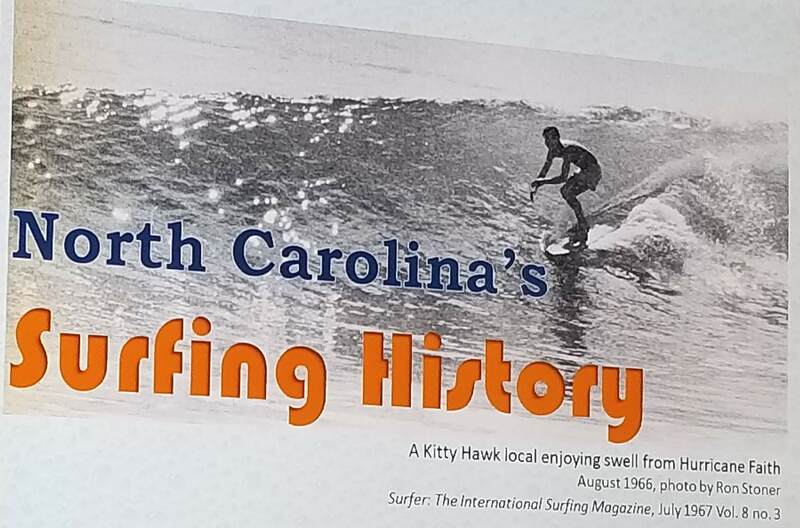 However, the Surfing NC Project included the development of Surfing NC: A Timeline of the History of the Sport of Surfing in North Carolina, a book Ben co-authored with John Hairr. What struck me most was the amount of work involved to ferret out the history presented during the evening, and in much greater detail in the book. When our focus is on war or politics or other more institutionalized subjects, there are often good written records to follow. Surfing, however is more informal, with its proponents generally more interested in finding the next good wave than chronicling their activities in writing. Fortunately, Wunderly and Hairr have done much of that hard work and provided a fascinating history of the sport in North Carolina.